Our 6 best tips for laser cutting! Find out our 6 best tips for laser cutting! Laser cutting is an amazing manufacturing technique, it could help you to build big projects and work with various different materials. We recently told you about the best laser cut acrylic projects and the best laser cut wood projects. These two blog posts surely inspired you to create your own project using laser cutting or laser engraving. But before starting to develop your laser cutting project, you will have to take some aspects into account in order to get the best results possible. Follow the guide, in this blog post we are going to give you our best tips to help you with your laser cutting projects! Here is a quick reminder if you are not familiar with this technology. Laser cutting is a method that transforms a 2D file into a physical object. Laser cutting is working thanks to a highly accurate laser cutting the material with a continuous laser technology able to cut any materials with a high speed. The laser cutting process can cut parts with a thickness up to 10mm! For the laser cutting process, you can use a 2D vector file, made with vector graphics software. Laser cutting: Who needs to use this manufacturing technique? Laser cutting is for everyone. Companies searching for an advantageous manufacturing method, engineers, designers or artists. Laser cutting is used for industrial manufacturing applications, but it is also a way to customize products. For example, some companies offering products made with laser cutting are also offering their products with personalized engraving. Indeed this manufacturing technique has many different benefits. First, it is a really precise method to cut materials. It is also a cost-friendly technique, which is always a major advantage. It can be useful for various applications from jewelry and furniture, to business cards, anything is possible thanks to this amazing manufacturing method. Laser cutting could definitely benefit your company and no matter what is your sector and your project, you will find the perfect laser cutting material for it! Plus, keep in mind that this technology can be used for both prototyping and production. Discover our best tips for laser cutting. 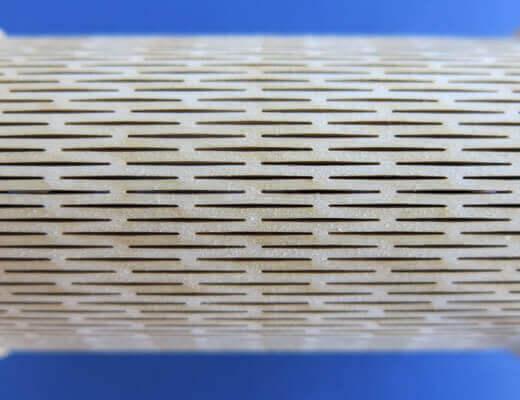 In order to get the best laser cut parts, we advise you to take into account these following tips, they will help you to make the most of this technology. Choosing the right material is important. Do you need a solid part? A translucent one? A rigid or flexible one? You will have to check the different properties of the material to see if it matches your expectations and your project. You will access materials with different design guidelines, different thicknesses, and colors. Find out which material will be the most adapted to your project! 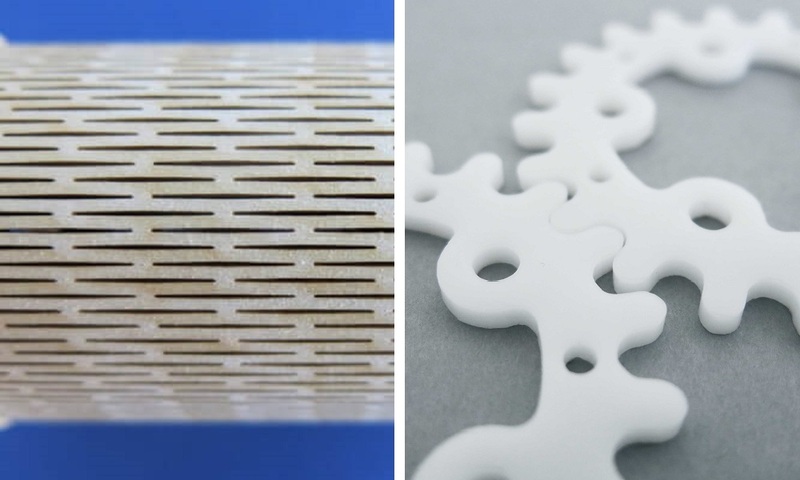 Check our laser cutting materials page and choose the material for your project among different wood materials, Plexiglas, plastics and so on. 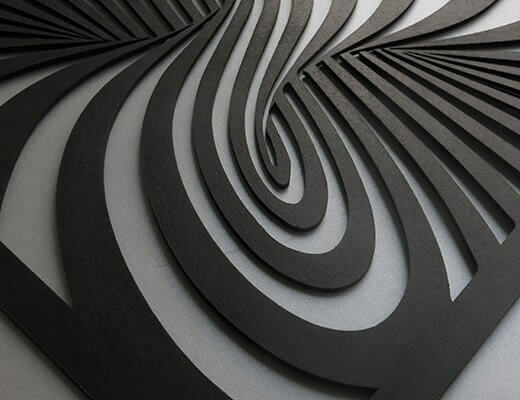 On Sculpteo laser cutting service you will access to Acrylic, different types of Plywood, MDF, Cardboard or POM. We recently changed the minimum spacing, to avoid errors and allow customers to get the optimum result when ordering their parts on our online laser cutting service. Now, the minimum spacing between two paths for laser cutting has to be equal to the thickness of the material. For example, if your acrylic part has a 2 mm thickness, the minimum distance between your two paths has to be equal to 2 mm. By following this minimum distance, your final object will be more resistant. If you are not respecting these spacings, your part might break. If you want to put text on your laser cutting or laser engraving project, you will have to be careful so it can be really readable. Here is some advice if you want to put text on your project. Don’t hesitate to space the letters and don’t write too small. Indeed, we are noticing that a lot of our customers are not especially thinking about the spacing between the letters. It is really an important point as if the letters are too close and overlap, it will make the inscription illegible. It would be a shame to make this mistake and have to start all over again. Moreover, the texts must be treated like shapes: they must be vectorized and respect the same rules as every other shape! 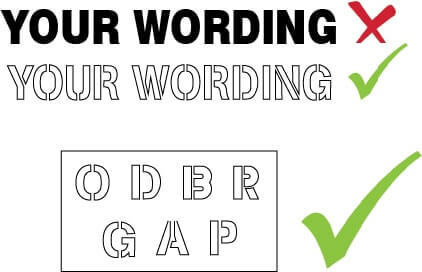 Be careful, for full letters (like A, D, O, B…) remember to create links between the inside and the outside of the letter. You can easily create these links on your own, but you can also use a special font like STENCIL, in which they already exist. If you want to use another font, you can find one directly on the internet! Laser cutting is an amazing way to manufacture big projects, that you can assemble. Indeed, it is offering the possibility to work on bigger size for a lower cost than 3D printing. The maximum size of your project will depend on the laser cutting material that you will choose for your project, so be sure to check the design guidelines of the material that you are choosing. Obviously, the parts that you will order can’t be bigger than the laser cutter itself. For smaller projects, we advise you to be very careful to respect the minimum size of 15mm x 15 mm. Indeed, objects of this size are all susceptible to not be delivered. You don’t need advanced design skills to create your 2D model for laser cutting. But if you want to find great 2D models without designing them by yourself, there are some marketplaces online that might be great for you. Check out this blog post, we are going to tell you where to find the best professional laser cutting designs! But you can totally create these models by yourself. This way, you will be sure that the design will match your expectations! It is not that difficult, and you can also follow our tutorials to prepare your file for laser cutting. We are a laser cutting and 3D printing service. How is it working? You just have to upload your vector file on our website, choose the materials, the shipping option, and then we are going to take care of all the rest with our professional laser cutters! At Sculpteo, we are using continuous laser cutters. You will have short lead time, no minimum orders and there will be no material waste! You only pay for the material that you need for your project, which makes laser cutting a money-saving manufacturing technique. Give it a try! We hope that all of these pieces of advice will help you with your laser cutting projects. If you have any question about our laser cutting service, you can contact our sales team, they will answer all of your questions. Do you want to read more blog posts about the laser cutting technology? We recommend you to subscribe to our weekly newsletter!